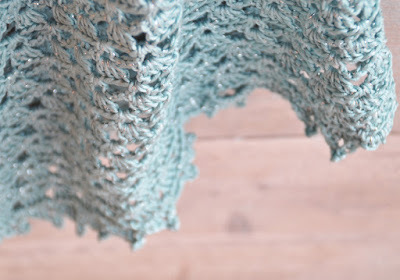 Crochet a Spring Scarf - Timeless, multifunctional and the glittery spark makes this scarf a fashion musthave! Continue reading for the free pattern! Note: The pattern is written in US crochet terms. The pattern starts in the middle of the widest part. You'll end with the point of the scarf. Ch. 5 and close with sl.st. 1 in the first ch. Row 1: Ch. 3 (= dc. 1), dc. 3 in the ring, ch. 2, dc. 4 in the ring. Do not close this row but turn your work. Row 2: Ch. 3, dc. 3 between the 1st and 2nd dc. of the previous row. Ch. 1, (dc. 4, ch. 2, dc. 4) in the 2-ch. space, ch. 1, dc. 3 between the last 2 dc., dc. 1 in the upper ch. of the 3 ch. Turn your work. Row 3: Ch. 5, dc. 1 between the 1st and 2nd dc., ch. 2, large V-stitch in the 1-ch. space, ch. 2, large V-stitch in the 2-ch. space (middle), ch. 2, large V-stitch in the 1-ch. space, ch. 2, dc. 1 between the last dc. 2, ch. 2, dc. 1 in the upper ch. of the 3 ch. Turn your work. Row 4: Ch. 3, dc. 3 in the 2-ch. space, ch. 1, (dc. 4, ch. 2, dc. 4) in the large V-stitch, ch. 1, (dc. 4, ch. 2, dc. 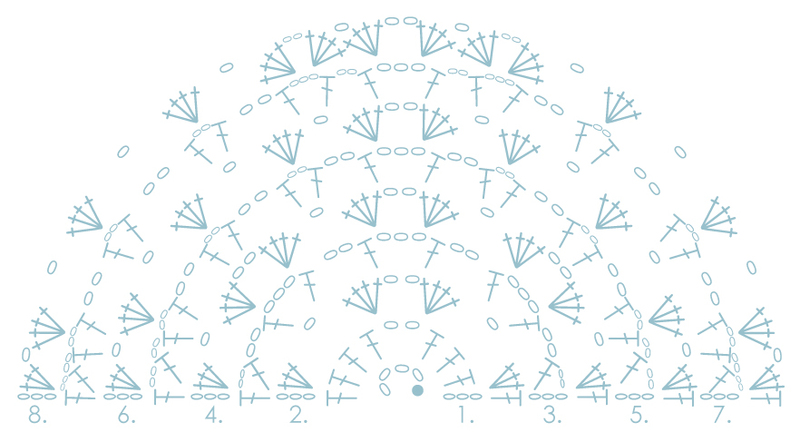 4) in next large V-stitch (middle), ch. 1, (dc. 4, ch. 2, dc. 4) in next large V-stitch, ch. 1, dc. 3 in the 2-ch. space, dc. 1 in the 3rd st. of the 5 ch. Turn your work. Row 5: Ch. 5, dc. 1 between the 1st and 2nd dc., ch. 2, V-stitch in 1-ch. space, ch. 2, V-stitch in the 2-ch. space, ch. 2, V-stitch in 1-ch. space, ch. 2, large V-stitch in the middle, ch. 2, V-stitch in 1-ch. space, ch. 2, V-stitch in next 2-ch. space, ch. 2, V-stitch in last 1-ch. space, ch. 2, dc. 1 between the last 2 dc., ch. 2, dc.1 in the upper ch. of the 3 ch. Turn your work. Row 6: Ch. 3, dc. 3 in the 2-ch. space, ch. 1, *(dc. 4 in next V-stitch, ch. 1)* Repeat from *to* another 2x. (dc. 4, ch. 2, dc. 4) in the middle. Ch. 1, *(dc. 4 in next V-stitch, ch. 1)* Repeat *to* another 2x. Dc. 3 in the last 2-ch. space, dc. 1 in the 3rd ch. of the 5 ch. Turn your work. Row 7: Ch. 5, dc. 1 between the 1st and 2nd dc., ch. 2, (V-stitch in next 1-ch. space, ch. 2) Repeat until 1 ch. space before the center. Large V-stitch in 1-ch. space, ch. 2, large V-stitch in the middle, ch. 2, large V-stitch in next 1-ch. space, ch. 2 (V-stitch in next 1-ch. space, ch. 2) Repeat until last ch. space. Dc. 1 between the last 2 dc., ch. 2 dc. 1 in the upper ch. of ch. 3. Turn your work. Row 8: Ch. 3, dc. 3 in the 2-ch. space, ch. 1, (dc. 4 in next V-stitch, ch. 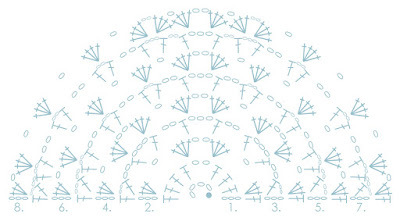 1) Repeat until you arrive at the large V-stitch. (Dc. 4, ch. 2, dc. 4) in large V-stitch, ch. 1, (dc. 4, ch. 2, dc. 4) in the middle, ch. 1, (dc. 4, ch. 2, dc. 4) in next large V-stitch, ch. 1, (dc. 4 in next V-stitch, ch. 1) Repeat until the last V-stitch. Dc. 3 in the last 2-ch. space. Dc. 1 in the 3rd ch. of the ch. 5. Turn your work. Row 9: Ch. 5, dc. 1 between the 1st and 2nd dc., ch. 2 (V-stitch in next 1-ch. space, ch. 2) Repeat for the next 1-ch. spaces. V-stitch in 2-ch. space, ch. 2, V-stitch in 1-ch. space, ch. 2, large V-stitch in the middle, ch. 2, V-stitch in 1-ch. space, ch. 2, V-stitch in 2-ch. space, ch. 2. (V-stitch in next 1-ch. space, ch. 2) Repeat until last 1-ch. space. Dc. 1 between the last 2 dc., ch. 2, dc. 1 in the upper ch. of the ch. 3. Turn your work. Row 10: Ch. 3, dc. 3 in the 2-ch. space, ch. 1 (dc. 4 in next V-stitch, ch. 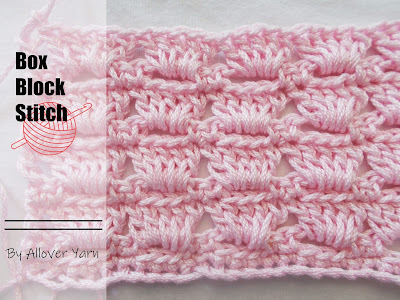 1) Repeat until you arrive at the large V-stitch. (Dc. 4, ch. 2, dc. 4) in the middle, ch. 1 (dc. 4 in next V-stitch, ch. 1) Repeat until the last V-stitch. Dc. 3 in the last 2-ch. space, dc. 1 in the 3rd ch. of the ch. 5. Turn your work. Repeat the rows 7 - 10 another 10 times. = 50 rows in total. Edge:Row 1: (Ch.6, sc. 1 in the 1-ch. space) Repeat until the middle. Sc. 1, ch. 6, sc. 1 in the 2-ch. space (Ch. 6, sc. 1 in the 1-ch. space) Repeat until end, Ch. 6, sc. 1 in the last dc. Turn your work. Row 2: (Sc. 1, hdc. 1, dc. 1, picot, dc. 1, hdc. 1, sc. 1) in each 6-ch. space. Cast off and weave in the loose ends.